The prospect of eating a perfect 5 is like the prospect of dating a perfect 10. What exactly do I bring to the party – except an appreciative, ‘Aren’t I lucky! Yum….’ ? Well it was a bit like that at Poornima’s birthday dinner when I found myself playing Dudley Moore to the Bo Derek of chicken biryanis – a hottie from Kadiris of Hendon. Everyone who reads this blog or knows Poornima is aware that the Kadiris chicken biryani achieved legendary status after being rated an overall 5/5 on the biryanometer. Conscious of this star guest, and knowing there would be stiff competition for the object of my lust from Poornima’s foodie friends, many of whom have black holes masquerading as stomachs that would fox Professor Brian Cox; I endeavoured to make sure I was at the front of the queue when the biryani was unveiled. It looked and smelt delicious. Unashamedly I heaped my plate. A friend remarked on my greed, but I put this down to jealousy that her tactics of playing it cool with a modest portion and a planned second helping which caused her no end of anxiety as she was forced to watch the steady snake of suitors help themselves. Eventually she got her second date, but meanwhile I could relax knowing I would be sated. And I was not disappointed. Ok, looks aren’t everything and neither are scores, but at the risk of being politically incorrect – on Saturday night they were. Words that come to mind are succulent, spicy, subtle, fulfilling, and don’t get me started on the Wet/Dry index. 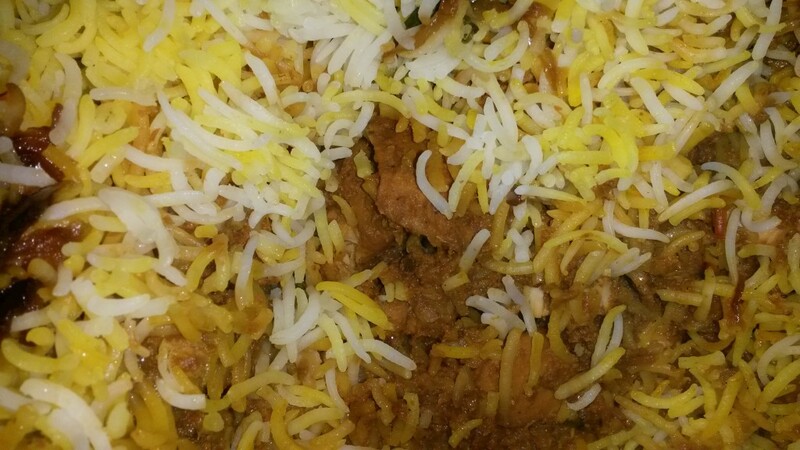 This entry was posted in Biryani and tagged biryani, chicken biryani, chicken biryani recipe, Indian food, Kadiri's, recipes by Poornima. Bookmark the permalink.